As we get close to the end of the semester, it’s been quite busy in the archives. Students are trying to finish research papers and everyone else wants to wrap projects up before the rush of the holidays. Last week was particularly wild, but during a brief respite there was one very pleasant moment of serendipity. Not two hours after I put up the post about Zevi Salsburg, a gentleman came in looking for a copy of the operations manual for the R1 computer. He turned out to be Sigsby Rusk, a Rice physics Ph.D. who had become the head of the computer project in 1966. 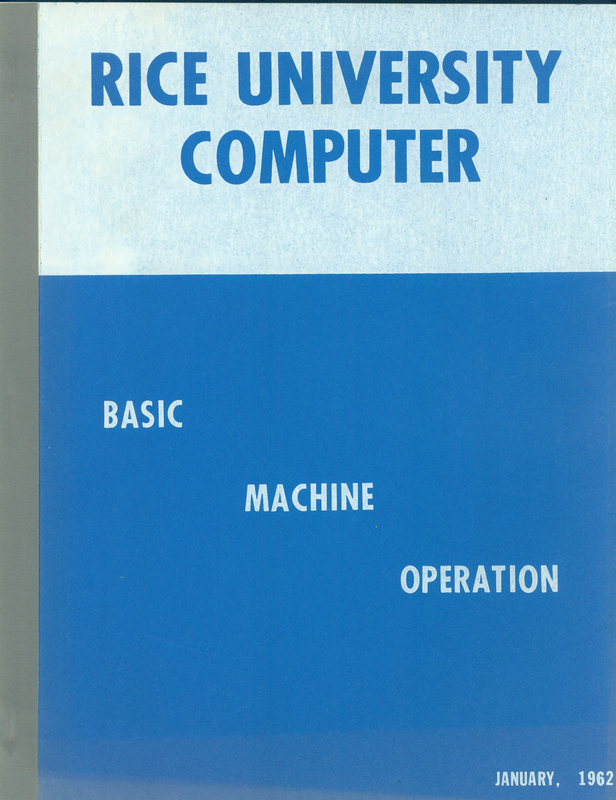 (Rusk was also the source of the photographs that are included in the short history of the Rice computer.) We had the manual he was interested in, as well as a couple of boxes of other documentation and some photos. I spent some thoroughly enjoyable time talking with him about the computer and the people involved with it and looking through some of the pictures. It was all interesting, but the thing that really caught my attention was an accident–one of the photographs seemed to be out of place. 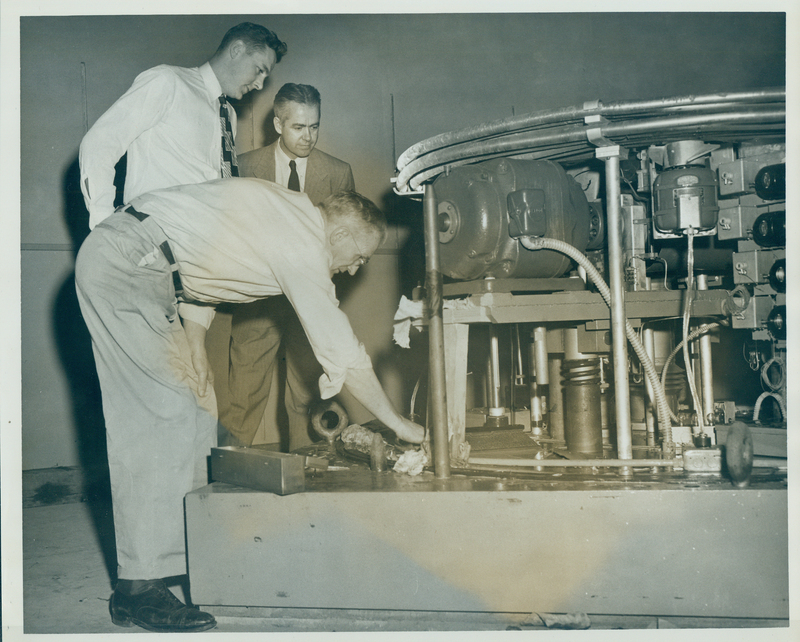 Rather than a picture of the R1 or its crew, it shows Tom Bonner (in coat and tie) of the physics department standing near part of the van der Graaf accelerator that was so critical to mid-century Rice’s strength in physics. With him, bent over the apparatus, is a man that Mr. Rusk identified as Frans Vander Henst. I had heard of Vander Henst, often, but this was the first time I’d ever knowingly seen him. Staff members, no matter how important their role, often completely disappear from the historical record. This is nearly true of Vander Henst. Unlike the faculty who worked in the department, only the smallest traces of him remain in the archives. Here’s everything I know: He came to Rice in it’s earliest days. He arrived in 1920 from Holland, where he had been highly trained as a scientific technician, and took charge of the physics shop. He retired 48 years later, having overseen the transition from relatively simple machinery to nuclear reactors. His name appears in the directory and we have a copy of his obituary. (He died in 1992 at the age of 94.) Most of the people who told me stories about him are now themselves gone, and there is only a vague memory of him on campus anymore. What is remembered is that he was kind of a joker. The only thing that gives any sense of what his importance may have been are the “thank yous” in the acknowledgment sections of a great many Ph.D. dissertations and scholarly articles. Great post and a great blog. Thanks for sharing!